Tesla, the anti-Solyndra, repays DoE loans 9 years early. 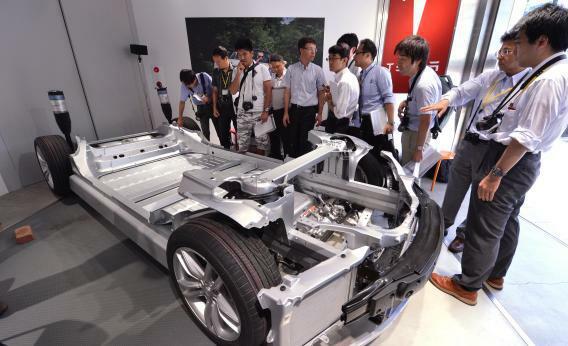 Japanese reporters examine the chassis of a Tesla Model S at a press event in Japan in August 2012. It’s official: Tesla is the anti-Solyndra. The Silicon Valley electric-car startup has often been lumped in with “losers” like Solyndra and Fisker when Fox News commentators and Republican presidential candidates criticize President Obama’s green-energy subsidies. This has always been absurd, and maybe now it can finally be put to rest. Today, Tesla wired the U.S. government some $452 million dollars, using a portion of the $1 billion it just raised on the debt and equity markets. That means that it has paid back its 2010 Department of Energy loan in full, with interest, nine years early. The highly publicized failures of DoE loan and grant recipients such as Solyndra and Ener1 have lent Obama’s green-energy programs a toxic tinge, especially among fiscal conservatives. Those bad bets have always been outnumbered by the good ones. But now, for the first time, the administration has a success story whose hype matches that of the busts. And it isn’t just this administration. People often forget that the loan program actually started under George W. Bush. The government’s profits from Tesla’s success—about $12 million—don’t cover its losses it incurred from the loan recipients that failed. But that was never the point. The reason the Department of Energy was making these investments was to kickstart a fresh, promising, and environmentally responsible sector of the economy, not to reap a cash windfall. As far as I can tell, there’s no financial or legal reason that Tesla had to pay back this money so far in advance of the due date. Rather, the lump-sum payback is a symbolic act on the part of the company’s brash CEO, Elon Musk. Bloomberg’s Alan Ohnsman wrote that Musk is channeling Lee Iacocca, who made an early repayment of government loans as Chrysler CEO 30 years ago. From what I know of Musk, it might be more accurate to say he’s one-upping Iacocca, paying back his loans nine years early to Iacocca’s seven. Then again, the situations are different. Chrysler was struggling to stay solvent, while Tesla has been on an upward trajectory from its inception in 2003. It might well have succeeded without any help from the government. Even so, the federal government deserves credit for its supporting role in one of the great American business success stories of the 21st century so far—one that may be remembered long after Solyndra is forgotten.